and members of the Subscribers’ and Supporters’ Clubs under the charmanship of director Mr. Ray Hall. In the League, the ‘Port finished in twelfth position. The feature was a fine unbeaten run of eight games which followed immediately on a 6-0 defeat at Chesterfield on Boxing Day and lasted until the visit of Wrexham at the end of February. never fulfilled- h.:3 early promise. moving on later to Wigan Borough. Crewe, Chester and Macclesfield Town. important, his appointment of a scout in the north-east paid handsome dividends in the following years. He was succeeded in March by J. J. Cummins. Jack Martin went to Macclesfield, although he did rejoin the club briefly in 1980. Of the forwards, Albert Sissons, signed twelve months earlier hem Leeds United. for two yeas and was nicknamed the “Mighty Atom” by the crowd, with whom he was a great favourite. 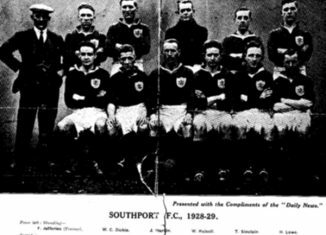 After two years of Cup successes, Southport’s luck ran out. Although Annfield Plain were easily accounted for. Stockport County proved too strong at Edgeley Park and won comfortably. By and large, this was a disappointing year; the club lost almost £2,000, with expenses amounting to £200 per week and average income only £143. Too many of the close season signings had failed to come up to expectations. Clearly Jimmy Cummins had a lot of hard work ahead.